The experimental Trump Archive, which we launched in January, is a collection of President Donald Trump’s appearances on TV news shows, including interviews, speeches, and press conferences dating back to 2009. 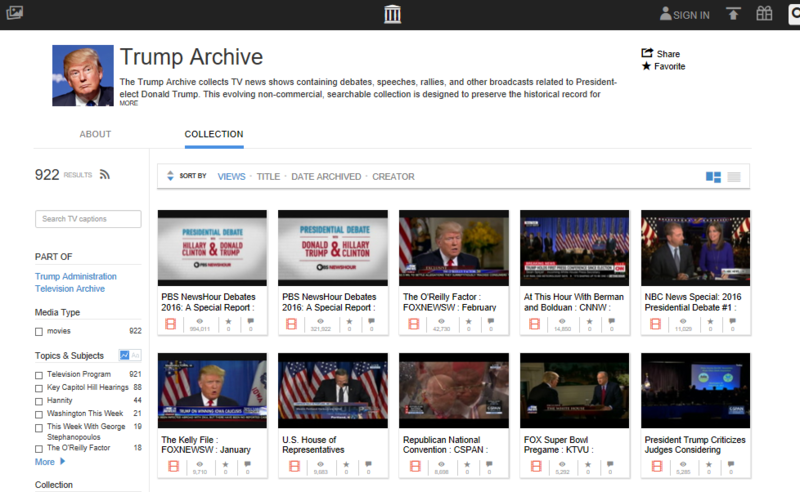 Now largely hand-curated, the Trump Archive is a prototype of the type of collection on a public figure or topic possible to make with material from our library of TV news. We are starting to reach out to machine learning collaborators to develop tools to make it more efficient to create such collections, and we have plans to publish similar collections on the Congressional leadership on both sides of the party aisle. 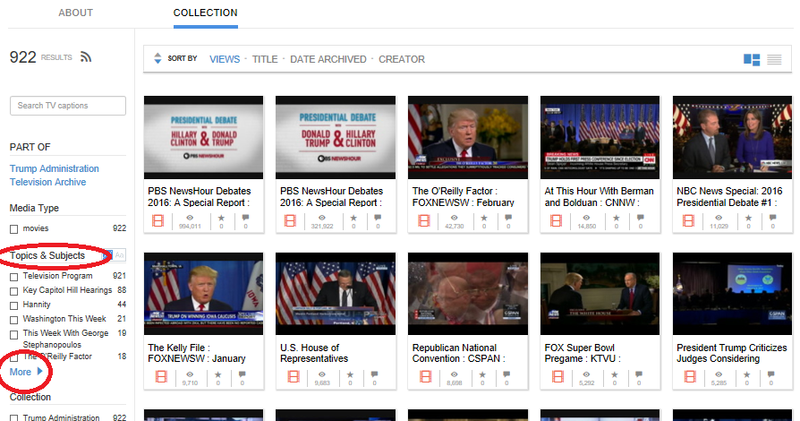 The growing Trump Archive contains a lot of content–928 clips and counting–so we’ve put together some pointers and ideas for how to use the collection. The Trump Archive is a great place to spend time if you’re hungry for aggregated fact-checking and added context around President Trump’s statements. We incorporate fact checks from our partners at FactCheck.org, PolitiFact, and The Washington Post’s Fact Checker in a variety of ways. From this page you can explore TV programs that include at least one fact-checked Trump statement. After choosing a program, look for the fact-checked icon on the program timeline. When you click on that icon, you’ll be able to watch the video of the statement and then click through to a fact-checking article by one of our partners. And if you’re eager to look for a specific topic, such as “terrorism,” or “immigration,” this table is a great place to start. You can search for a topic using the trusty find function on your computer, or download the table and view the list as a spreadsheet. Find a list of topics at PolitiFact and FactCheck.org. 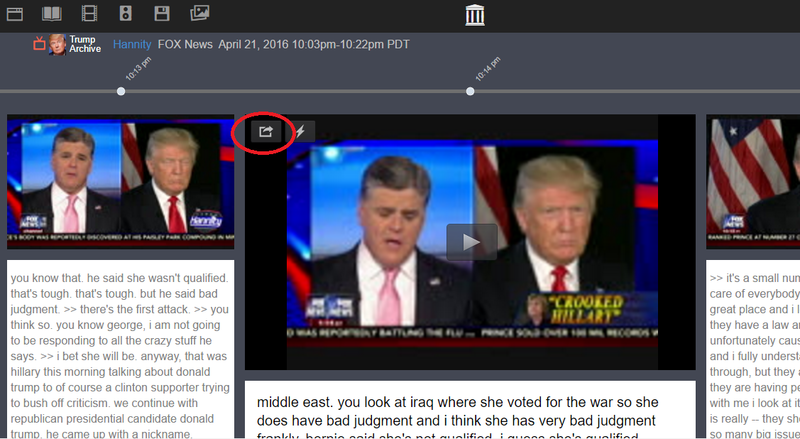 The search function, on the left side of the screen on the front page of the Trump Archive, allows you to find words or phrases within the closed captioning for a particular clip. Since those transcribers are working in real-time and at lightening speed, the captions don’t produce a perfect transcript, but they will get you really close to where you need to be. For example, I searched for “believe me” in the Trump Archive and came up with hundreds of results. While that particular example may only be useful for artists and linguists, the functionality can be applied in many ways. For example, there are almost 200 results for a search of “Iran Deal,” 70+ results for “radical Islamic terrorists,” and when you search “jobs,” the results almost match the number in our total collection, revealing how often Donald Trump talks about jobs. When we heard the President would be taking action to remove an expansion of rights for the transgender community, we looked for what he may have said about it before by searching “transgender” in the caption search. It yielded six programs in which he spoke publicly about it. Because of the imperfect nature of closed captioning transcripts, your search is often more successful if you don’t try for an exact quote. For example, you may know Trump said something like “we can make the kind of change together that you dream of.” The closed captioning quote may actually be “an make the find a change together that you beam of.” But in those circumstances where you need to search for an exact quote, try using this, ~0. For example, “the lion, the witch, and the wardrobe”~0 . The ~0 tells the search box to look for all these words without any other words in between them, thus next to each other. Then check the boxes of the relevant program(s), in this case, 60 Minutes. Hit “apply your filters,” and then browse all the 60 Minutes programs in the Trump Archive. Once you find that video clip where Trump says something you want to share, you can make your own video clip of up to three minutes that can be easily embedded into a post. If you post the link on twitter, the clip appears within the body of the tweet and can be played without clicking through to the TV News Archive. A window will then open up to present (highlighted in orange) the closed captioning of the 60-second pre-defined segment—and the captioning of the 60 seconds before and after (not highlighted) for context. Important: the captions come from real-time closed captioning, which means they are often incomplete, garbled and not precisely aligned. This is all still an experiment, remember. Be sure to watch your clip before you post to make sure you captured what you meant to. “Grab” the quote marks at the beginning and end of the highlighted segment and through a bit of trial and error, find the right in and out points for the clip. Note that each time the quote marks move, the player starts to play and the URL changes to update the “start” and “end” points of the clip — named to reflect the number of seconds into the entire program. Remember: Watch your clip before you post. Pro tip: If you clip a quote that’s fewer than 10 seconds it might not play, so give it a bit of time to run. Copy the URL and paste it elsewhere. Click one of the variety of share method icons on the bottom of the edit window (Twitter, Facebook, etc.) The embed icon </> will offer two flavors of embed codes for the portion you have selected—one for an iFrame, the other for many WordPress sites. Fun, right? Now go share another. Let us know if you have any questions by emailing us at politicalad@archive.org; and please, do share what uses you find for the Trump Archive. This entry was posted in Announcements, News, Television Archive and tagged Donald Trump, fact checking, Factcheck.org, machine learning, PolitiFact, The New Yorker, The Wall Street Journal, The Washington Post's Fact Checker, Trump Archive, TV news archive. Bookmark the permalink. “For example, I searched for “believe me” in the Trump Archive and came up with hundreds of results.” — Generally liars use phrases like this to convince others that they are telling the truth but a lie is a lie. Thanks for the Trump Archive. Really useful info’s. This is terrific. What a great service, thank you very much.